UN Cyprus Envoy Downer Brags of Asia Business, Says No Conflict But What Safeguards? UNITED NATIONS, September 17 -- Former Australian foreign minister Alexander Downer, now working for the business consultancy Bespoke Approach and part time for the UN on Cyprus, was again asked Thursday by Inner City Press if the two roles might conflict, and what safeguards the UN has in place. Mr. Downer said most of his work with Bespoke Approach is in East Asia, with Indonesia and China. He said that because he was foreign minister of Australia for twelve years, he has good relations with China, "better than many people I know." Some thought this sounded like a form of advertisement, as did Downer's statement that he was asked about Cyprus during a dinner with Indonesia's Foreign Minister a few weeks ago. Downer said that he does no work with Cyprus, Turkey or Greece, and by this appeared to mean he does not negotiate contracts in the three, not that Bespoke Approach does not have business relations with enterprises active there. Inner City Press asked about an initiative in Australia to ban former minister from serving as lobbyists for two years. While Downer said this must have been passed only yesterday, since he'd never heard of it, from the audience in the briefing room Australian parliamentarian Paul Neville clarified that Queensland and New South Wales are moving on such a ban. Mr. Neville added that working for the UN wouldn't be considered lobbying. But what about working for Bespoke Approach? "Former Labor senator Nick Bolkus was paid a reported sum of $136,500 to lobby the Rann Government on behalf of the beleaguered South Australian Jockey Club, a board member says. SAJC director Bill Spear, who brought legal action last November against the state's biggest gallops club that resulted in its chief executive being sacked, yesterday raised further questions about the board's conduct... Mr Spear had earlier confirmed that during the past two months, while the board and the SAJC's now-sacked chief executive Steve Ploubidis were the subject of an independent inquiry over vote-rigging and alleged corruption, two payments each of about $68,000 were made to Mr Bolkus for lobbying on behalf of the club. Mr Ploubidis denies the allegations. Mr Spear said payments in excess of $10,000 had required board approval, which, to his knowledge, had not been forthcoming in this case. Mr Bolkus is a founding partner in Adelaide lobbying firm Bespoke Approach, with former Howard government foreign minister Alexander Downer, and businessman Ian Smith, who is married to former senator Natasha Stott Despoja." Downer said that he fills out a form for the UN Secretariat. But it is not clear if this form lists Bespoke Approach's clients. The UN's safeguards against conflicts by part time envoys appear lax, all the more so after the questions that have arisen since part time UN envoy to Niger, Canadian ex-diplomat Robert Fowler, was kidnapped while on non-UN business, visiting a Canadian owned gold mine. Click here for that story -- more than a week after basic questions were put to the Office of the Spokesperson for the Secretary General, still no answers have been received. Footnotes: Paul Neville the parliamentarian explained to Inner City Press that he has been sent to New York for the UN General Assembly for the next thirteen weeks. Responding to Robert Fowler's detour in Niger, Neville said that if he ventures beyond New York City, he has to get his own insurance. Inner City Press also asked Downer about leaked UN documents about his role in Cyprus, and will report that -- and attach some of the documents -- separately. Watch this site. At UN, Downer Says Has No Conflict in Cyprus, What Of Turkey, KKR? UNITED NATIONS, May 4 -- How does the UN police for conflicts of interest in its ranks? The answer appears to be, it doesn't. 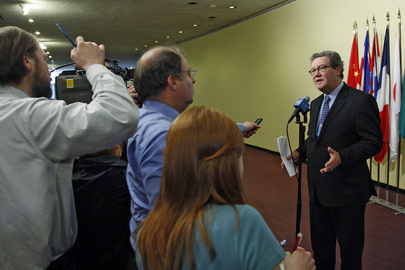 Last week the UN's envoy for Cyprus, Alexander Downer, took questions from the Press. Inner City Press asked, as it had in 2008, what safeguards are in place to ensure that Downer's job with business consultancy Bespoke Approach doesn't conflict with his activities in and around Cyprus. Downer assured that he wouldn't allow conflicts, adding that Cyprus doesn't have that much business. Neither is a satisfactory response at the organization like the UN. Only a few month ago, the UN's stealth envoy to Niger, former Canadian diplomat Robert Fowler, was kidnapped in Niger while on his way to visit a Canadian-owned gold mine, apparently not on UN business. The UN has still refused to answer questions, even after Fowler had been released, reportedly in exchange for the freeing of terrorism suspects. Downer's answer as to Cyprus is particularly insufficient because Bespoke Approach work with Turkey (or Greece) would also be a conflict. The investment firm KKR lists an affiliation with Bespoke Approach. Who is policing these conflicts? Not the UN. Inner City Press: there’s been some controversy or questioning about if you can be the envoy and also have side job as a businessman? Downer: Well, I was employed part-time not full-time so I have to keep body and soul together. I’ve got a wife, I’ve got children. My daughter got married last week, I just have to pay for the wedding and thank you for congratulating me. It’s only a part-time job. Of course I have absolutely no business with Cyprus at all. I have absolutely no business involvement there. To have business involvement there would be a conflict of interest. Cyprus would be the greatest of perspective, I love Cyprus, is not a very big place, it’s not like the United States. So business doesn’t arise day-by-day between Australia and Cyprus. Inner City Press: I found on the UN website of bespoke approach, it says you are a good person to hire in part, because you work for the UN. So some people wonder whether it’s appropriate to …..
Downer: Let's just say I’m a good person to hire because if you read it carefully, because I work for the UN, it just explains my CV. You are working in the media and so I think you would appreciate this point in the way that I do. I think transparency is incredibly important. Therefore, it wouldn’t be honest to hide from anybody who may use bespoke approach. But it’s a fair question to ask because obviously I have to be careful there is no conflict of interest. Also I work as a professor at Adelaide University. In that capacity I do talk to people about Cyprus from time to time. In Australia there’s quite a lot of interest on Cyprus. There are nearly 100,000 Australian Cypriots. They split about 60 – 40 Greek Cypriots, Turkish Cypriots. So they keep me busy as well as some of them are on campus of the university. One of them was at my daughter’s wedding actually last week and started lobbying me furiously about some issue to what I’m going to do.